Home / news / More than an Overcomer! This week we introduce our second “unfit dad” Nigel Williams. Nigel’s passion for his community and children is rooted in having to overcome many obstacles himself. We are privileged to be able to share a bit of his story and learn why this initiative is so close to his heart. Nigel: My name is Nigel Williams, I am 50 years old and married to Chevonne Williams. We have two sons, Andre (23) and Lushin (16). 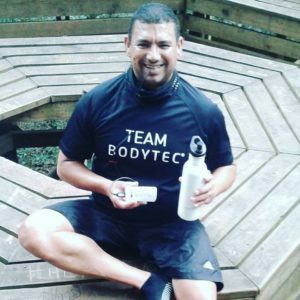 I’m a personal trainer at BODYTEC City bowl and a group exercise trainer at Virgin Active. I also do voluntary work for two non-profit organizations – Study Buddyz and Horizon Discovery. I love working with people, I love cooking…not that I’m a great cook! Other hobbies are hiking and swimming and I sing on our worship team at Family church and for the Keith and the PMP Choir. 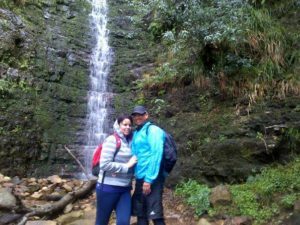 Nigel enjoys hikes, especially when he gets to do it with his wife! Nigel loves helping and inspiring others – his work as a personal trainer helps him to do this every day. Nigel: I went to Norma Road primary and Athlone high school. While I was in primary school, I was placed in a class for children with support needs as I struggled academically and I could not concentrate for long. That helped me a lot in the same way that I believe Inclusive Education is helping children today. This is the reason why I’m doing the Two oceans 21km. Even though I don’t like road running, I always wanted to raise funds through running. I’m so blessed to be doing this for Inclusive Education SA. Nigel: I have done ultra-marathons before but then while I was cycling one day, I got knocked over by a car and broke my left leg. After surgery, while lying in hospital, I decided not to give up because there was a man in the same ward that had a spinal injury. The doctors told him he will never walk again, but all the men in that ward had injured limbs and we inspired each other not to give up. With great determination and willpower, this man was able to overcome his injuries despite what doctors had said. Nigel: To all unfit dads if you have positive people that walk with you then you will be more than an overcomer. I believe that is what Inclusive Education stands for. I am hoping not just to raise funds but to raise awareness so that we as a nation can stand together and make a difference even if its just in one child’s life. That action then becomes a chain reaction. We have the ability to help people out of circumstances like poverty by granting them their right to access education. Nigel, along with our other unfit dads, needs 21 sponsors to donate R 100 each in order to reach his target of R 2100.00 If you would like to support him, please go to www.givengain.com/cc/3unfitdads/ to support the cause.